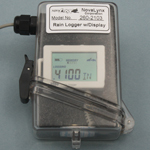 The 260-0111 Rain Gauge with 8" diameter collector meets NWS specifications for statistical accuracy. The body and base of the collector are constructed of UV-resistant plastic. The tipping bucket pivots on a stainless steel shaft. 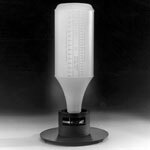 The 260-0111 Rain Gauge with 8" diameter collector meets NWS specifications for statistical accuracy. 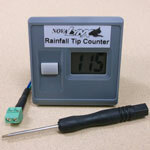 Every time the bucket tips, a count is transmitted to the recording device and the gauge empties. You never have to empty the gauge. Each tip of the bucket is equal to one hundredth of an inch of rain. The body and base of the collector are constructed of tough, UV-resistant plastic. The tipping bucket pivots on a stainless steel shaft to minimize friction and wear. Adjustment screws under each chamber of the tipping bucket allow you to fine-tune the calibration. 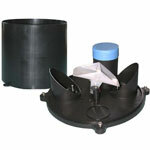 A debris screen in rain gauge cone helps prevent debris from clogging the funnel hole. Four mounting holes are pre-drilled in the base and four screws are provided for installation on a flat surface. The 110-WS-25RG includes a mounting arm to provide easy mounting of the gauge to the tripod mast using a 1-3/4" u-bolt.